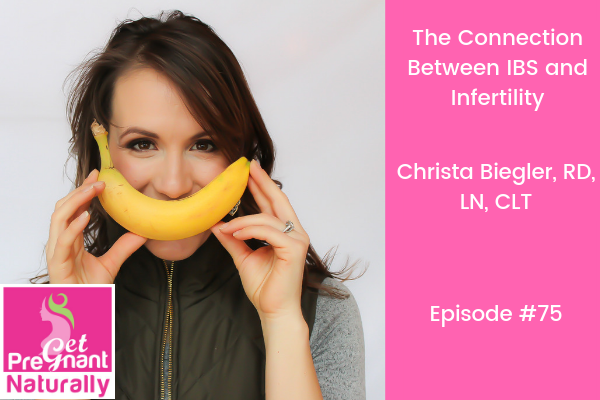 I’m excited to welcome Christa Biegler to the podcast. We’re digging into IBS and it’s connection to infertility. Christa Biegler, is an integrative dietitian nutritionist specializing in skin, digestive and autoimmune issues in private practice. She hosts The Less Stressed Life podcast, which focuses on inflammation reduction and upleveling life, health and happiness. Some 38-96 million Americans suffer from irritable bowel syndrome (IBS). Our collective digestive systems are a mess. Either you know someone with IBS, or you have it yourself. The thing is…it is over diagnosed. Why does this matter for your fertility? Digestive symptoms clear up…gut health improves. Helping you to get pregnant naturally. 1) Why treating IBS is helpful for someone who is trying to get pregnant. How IBS impact our hormones. Connection with IBS and endo. 2) Why IBS is over diagnosed. The conventional treatment versus the functional approach. We discuss side effects from medication. 3) How to address the root cause of IBS. Food sensitivity and stool testing and which test is right for you. Gut health and why it matters. 4) Mind body techniques for IBS, diet and supplement recommendations to normalize healthy bacteria in the gut.